Cornerstone is a delightful three bedroom link detached bungalow situated in a most sought-after location in Padstow, adjacent to the Camel Trail in a small pleasant cul-de-sac. The property has been extensively modernised and renovated by the current owners to create a tasteful and stylish home moments from the Camel Estuary. 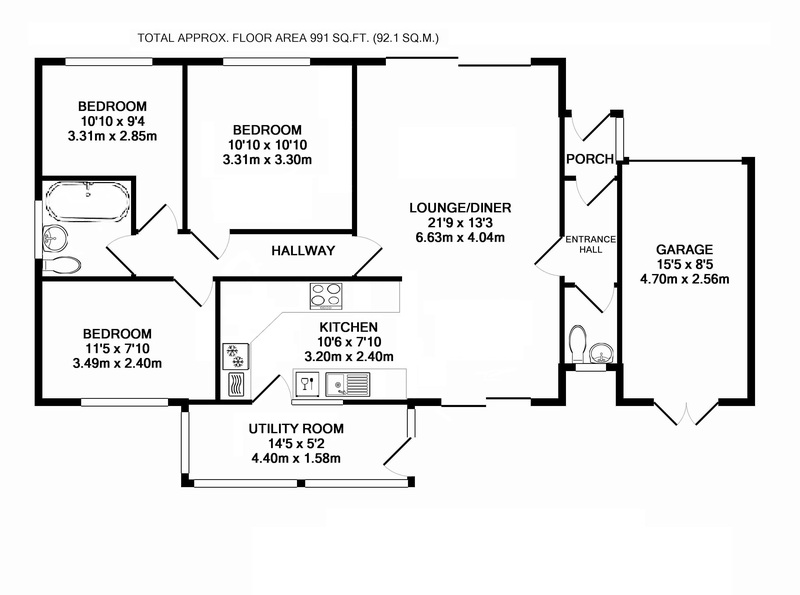 The property offers spacious open plan entertaining space comprising of a lounge/dining area and a stylish fully integrated kitchen complete with a Rangemaster double oven with five ring gas hob and extractor fan over, white composite sink and white composite worktop. There are three double bedrooms, family bathroom with bath and shower over, separate cloakroom and utility room, all tastefully decorated to a high standard. The property offers the alternative to be a fabulous family home or holiday investment located just yards from the Camel Trail and 10 minute walk from Padstow Harbour, yet in a secluded setting providing peace and privacy. Externally, the grounds are mainly laid to lawn with gardens to the front, rear and side elevations as the bungalow occupies a large corner plot. There is the advantage of an attached garage with electric roller door and plenty of parking in the driveway. Services to the property includes mains water, electricity and drainage with a mains gas fired central heating system. We highly recommend viewing to appreciate the lifestyle on offer for a lovely family or holiday home, in a superb location. The historic and picturesque fishing town of Padstow is located on the North Coast of Cornwall and offers an extensive range of cafes, public houses and restaurants, none more so than Paul Ainsworth's Michelin starred No.6 and of course Rick Stein's esteemed Seafood restaurant. An Area of Outstanding Natural Beauty, there are several sandy beaches within 2 to 4 miles as well as the championship golf course at Trevose. The town also has a supermarket and excellent Primary School. For more extensive shopping facilities, the thriving market town of Wadebridge is just 7 miles distant and offers a fine selection of shops and amenities including a sports centre, cinema, a primary and secondary school and a selection of supermarkets. The nearest mainline station is Bodmin Parkway which is approximately 20 miles distant with the nearest airport at Newquay approximately 14 miles away. To find Cornerstone, drive towards Padstow on the A389. As you approach Padstow, turn right at signs for Sarahs Lane and follow the road down the hill towards the Estuary. At the bottom of the hill, on the bend, turn right onto Moyle Road, follow the road round onto Porthilly View and Little Dinas is the cul-de-sac at the end of the road. Cornerstone is the first bungalow on the right hand side. The postcode for satellite navigation is PL28 8DQ.